Tom Vail is the founder of Canyon Ministries and a long-time Colorado River guide who lead Creation-centered trips through the Grand Canyon for 20 years. After working as a commercial river guide through the Grand Canyon since 1983, Tom became a Christian in 1994 and then proceeded to start a Christian ministry geared towards providing river trips through the canyon from a biblical creation perspective. Tom and his wife Paula reside in Phoenix, Arizona. For decades Tom Vail has been conducting Grand Canyon rafting tours where the tourists spend each day in the Word and camp under the stars along the riverbank at night. Throughout the trip the creationist’s model of the Earth’s origin, interpretation of the Canyon’s formation and its geology, human history, and ecology is taught to the tourists. 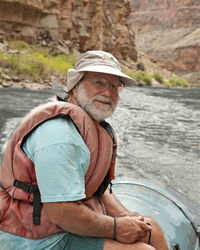 Over the years Tom has lead river trips through the Grand Canyon for many leading creation science organizations, scientists, and Christian leaders. Every year they partner with groups like Answers In Genesis and Focus on the Family to provide special trips through the canyon for supporters and followers of those organizations. In 2013 Canyon Ministries started offering daily tours at the Grand Canyon's South Rim. They currently provide creation-based guided tours to thousands of people each year on the rim, while hundreds of people continue to join the river trips through the canyon. Although Tom is now retired from personally guiding river trips through the canyon, he still serves as chairman of the board for Canyon Ministries and is involved in its day-to-day operation. Your Guide to the Grand Canyon: A Different Perspective. Green Forest, AR: Master Books. 2008. p. 192. ISBN 0-89051-501-8. This page was last modified on 30 November 2018, at 13:04.